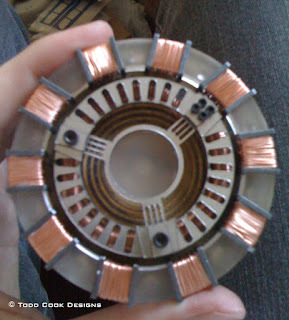 A couple years ago I had it in my head that I was going to build a complete Iron Man Mark 3 suit. 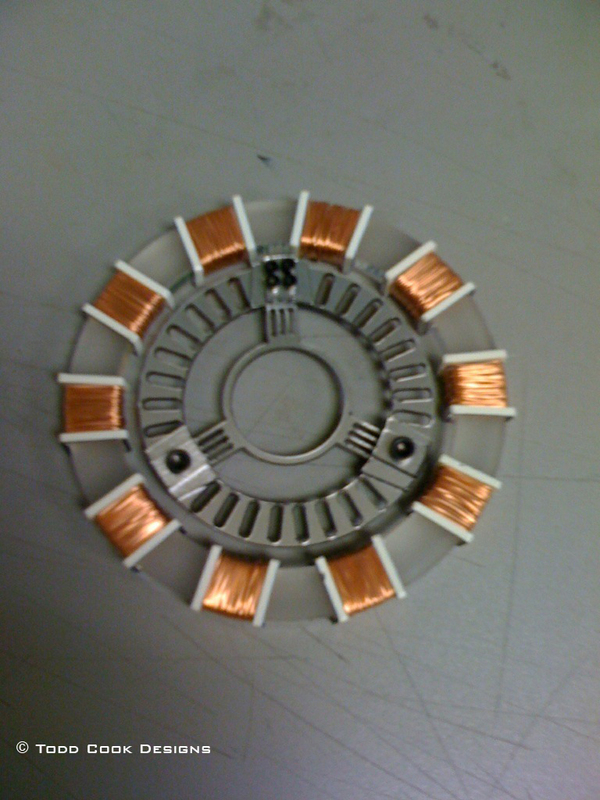 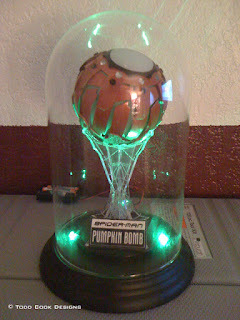 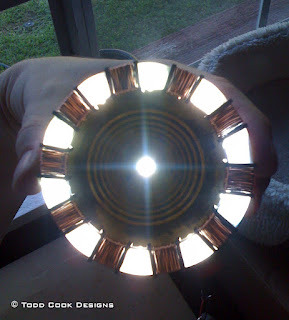 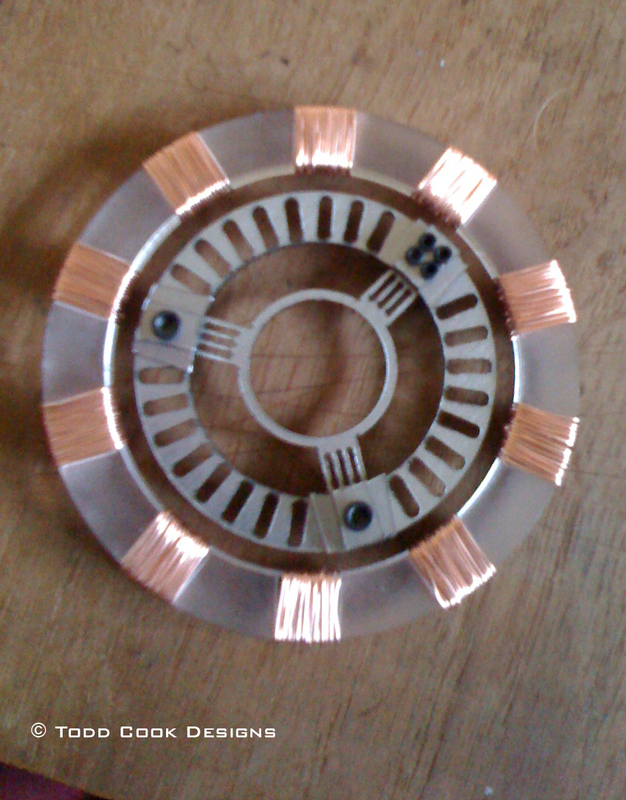 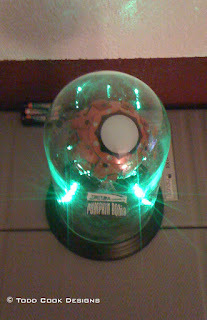 Well that didnt quite happen, but I did manage to build the arc reactor for it. 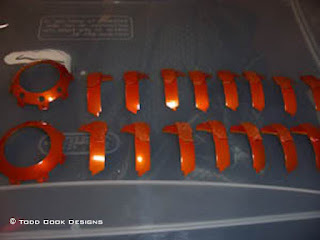 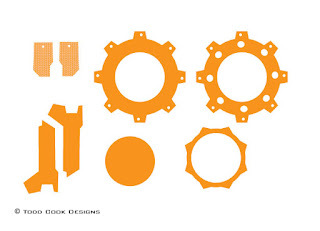 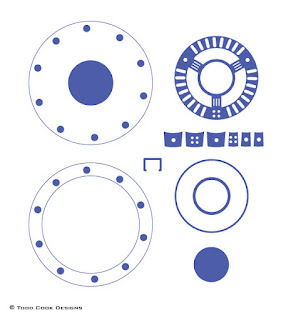 I made all the templates in Adobe Illustrator and had all the parts laser cut out of different materials. 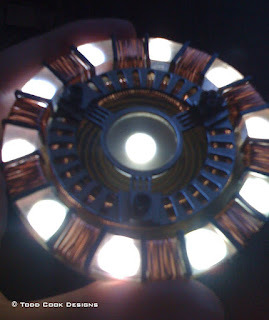 I also worked out the wiring for the lighting. It has 11 bright white LED's and runs off one 9V battery. 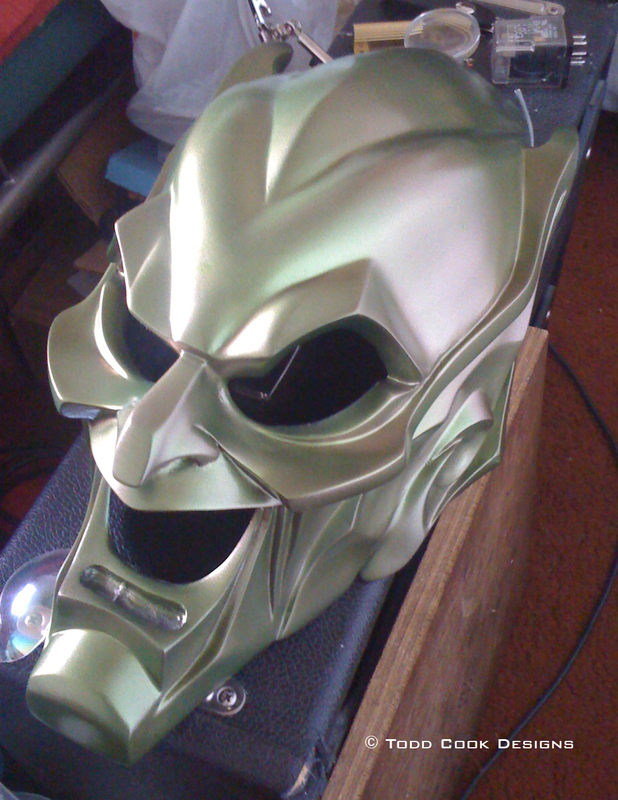 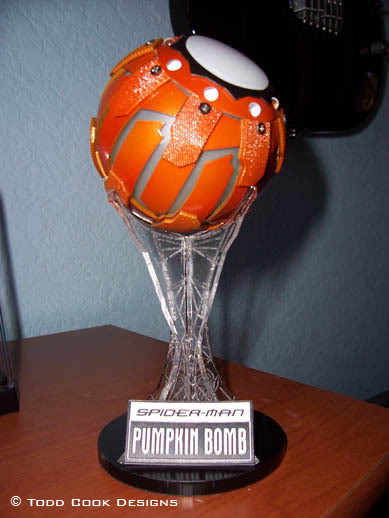 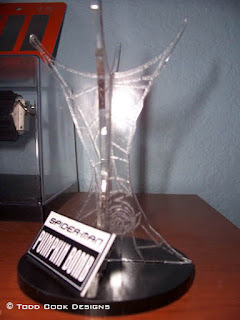 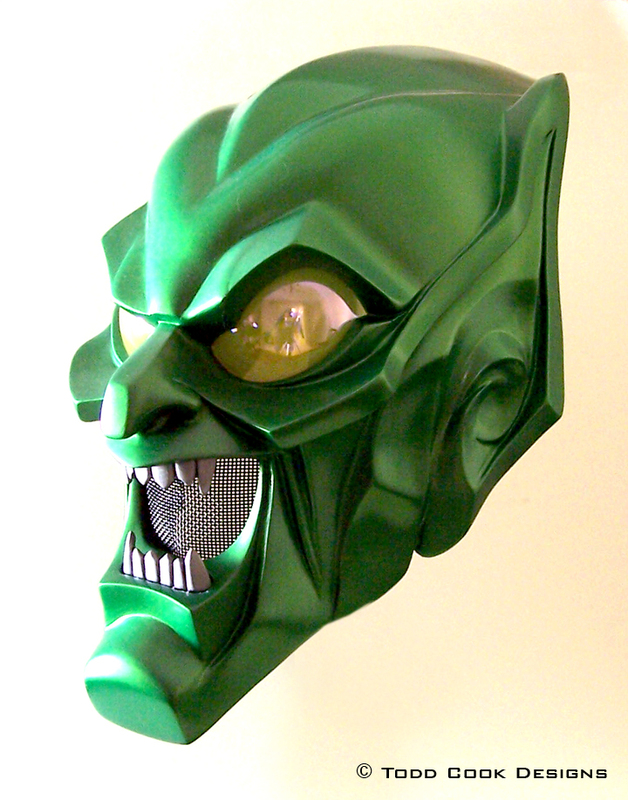 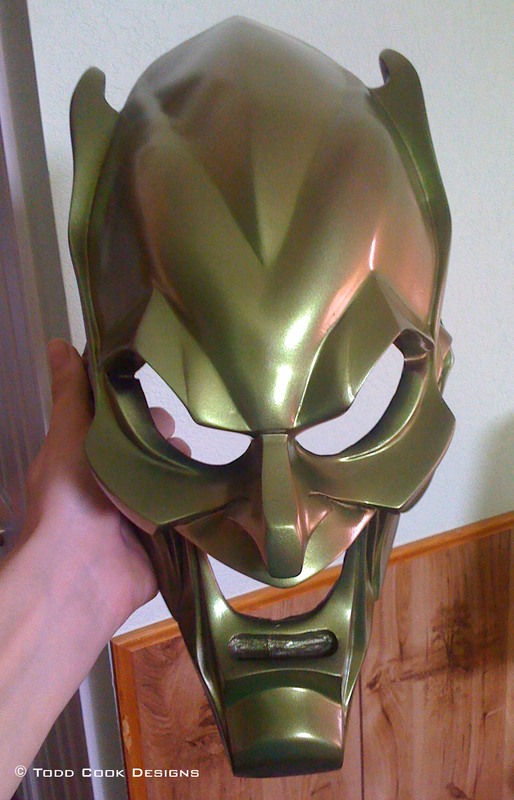 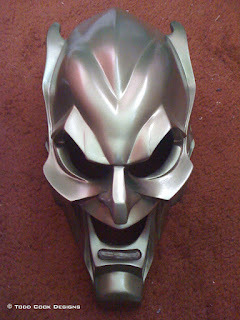 Years back I received this fan sculpt of the Green Goblin helmet from Spider-man the movie. 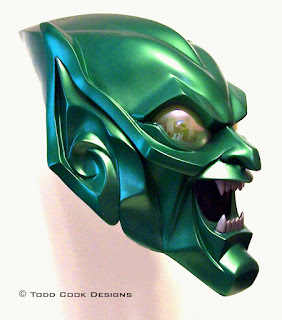 It was in pretty rough shape with broken teeth, cracking fiberglass, missing lenses and a ton of uneven areas. 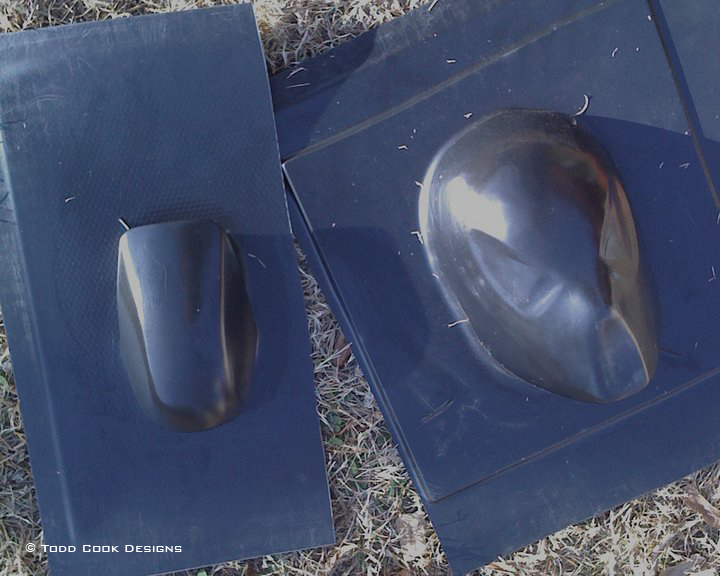 All was smoothed with automotive body filler and re-enforced with new fiberglass. 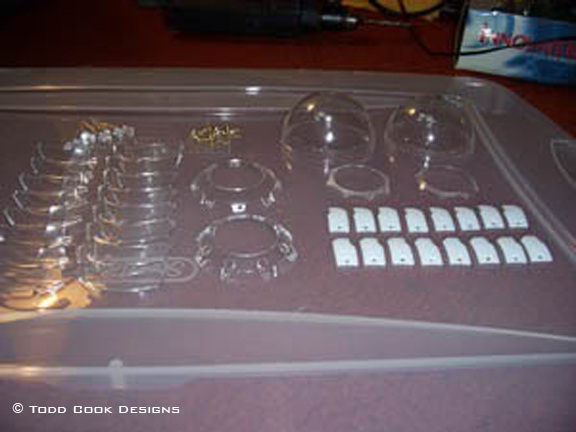 New lenses were cut from iridescent plastic ornament balls and the teeth were molded and recast. Unfortunately I dont have any other pictures of the helmet other than the ones taken at different stages of paint. 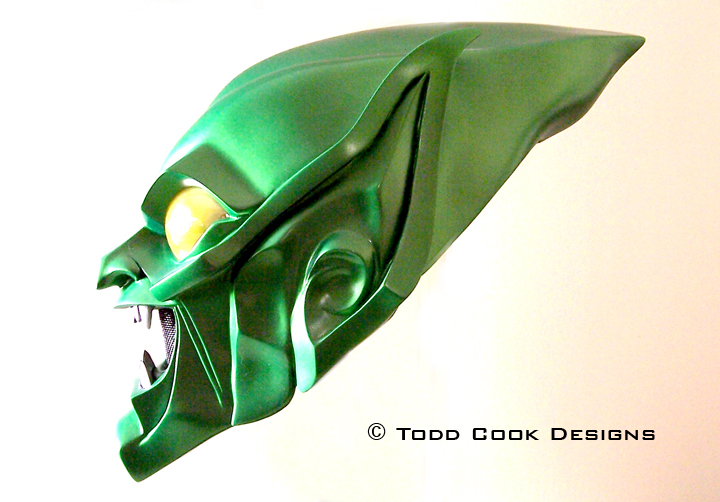 The final paint is a House of Kolor limetime green pearl with a purple/green flip clear coat and a super gloss on top. 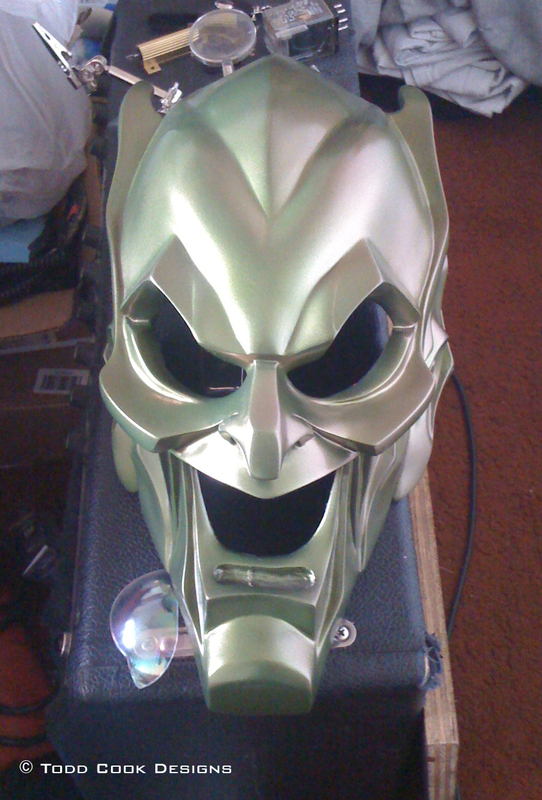 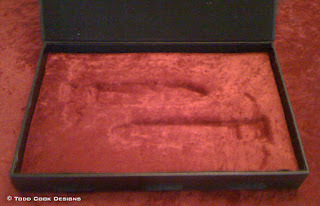 This is the original color I painted it at first, but it looked to silver to me, even though in other light it was green. It also had a green/salmon flip clear on it as well. 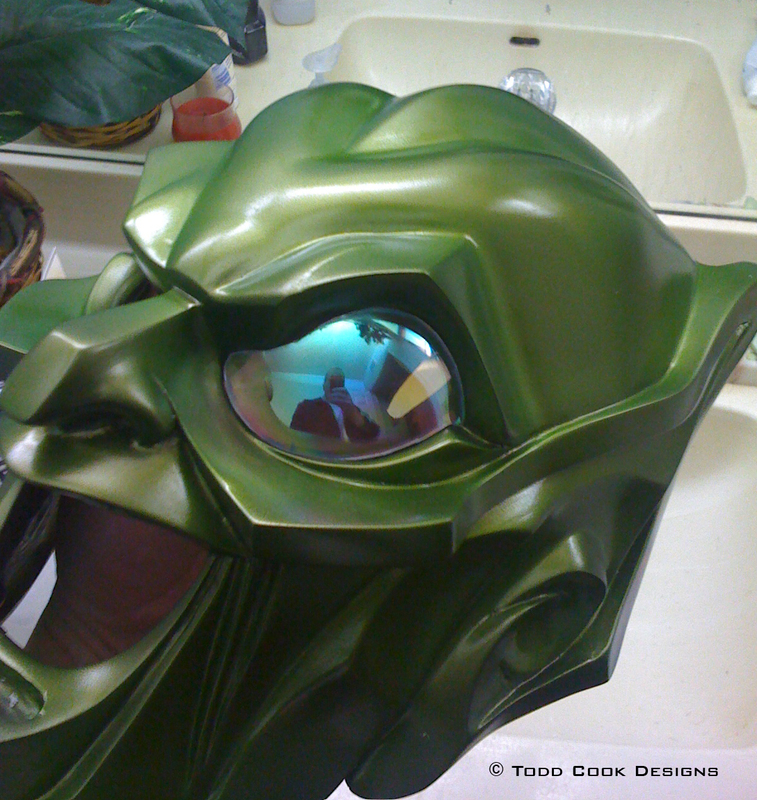 This picture was to show the test fit on the eye. These photo's of the helmet are the way it looks today. It changes color in every kind of light. 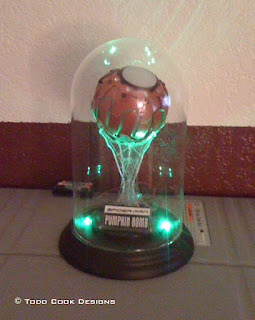 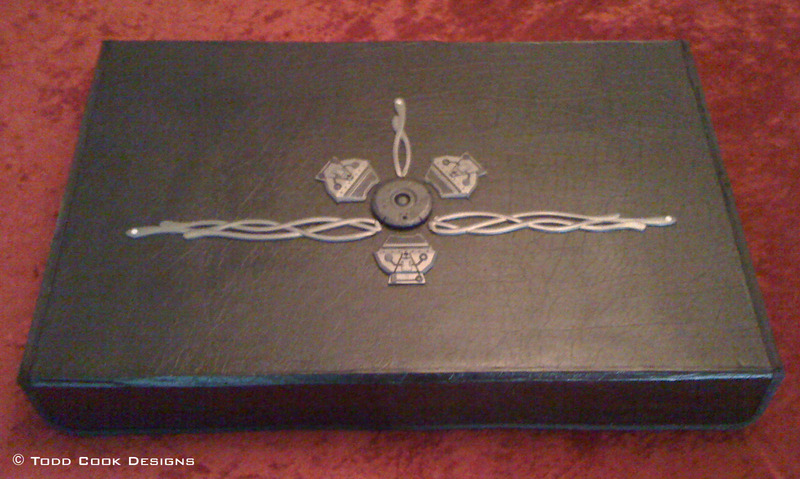 I wish it had more purple in the flip paint, but you never know I may revisit this prop again. 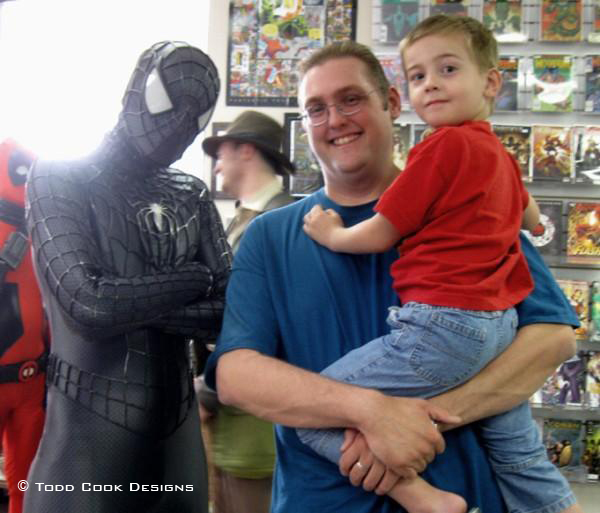 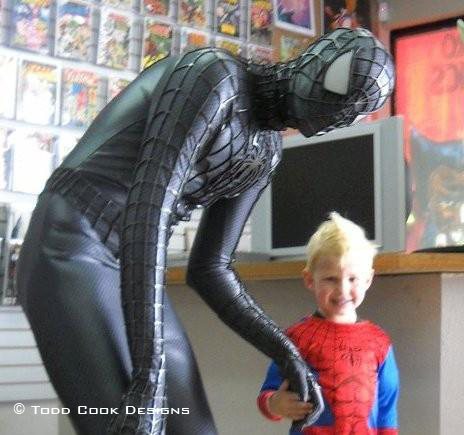 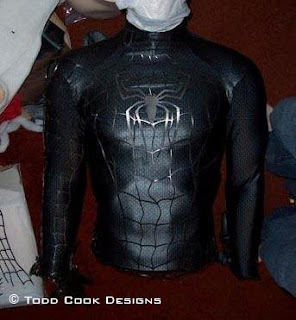 I had started building this suit for Halloween the year Spider-man 3 came out in theaters back in 2007. I had every plan of finishing it before Halloween, but I was having issues with the urethane rubber for the webbing not setting up correctly because of moisture in the air. 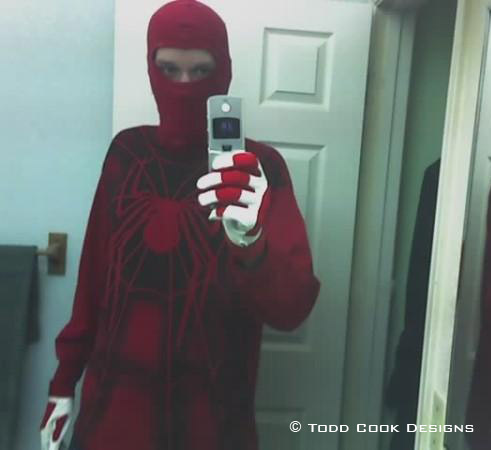 I ended up scrapping the costume for a few years, but eventually came back to it in 2010. 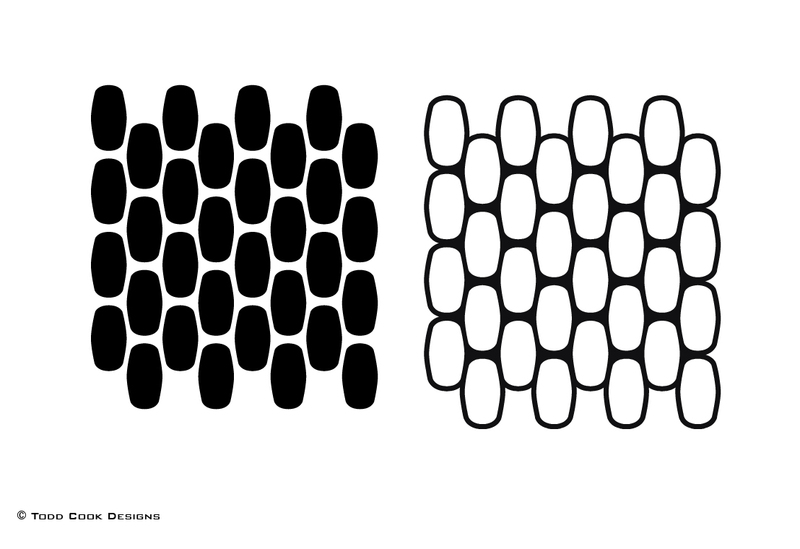 I'm actually kinda glad I had put it off for those years because I learned a lot more about the different types of materials and tricks working with them. Everything on this suit is custom made. Nothing was bought other than raw materials. 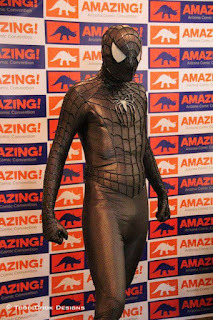 The fabric for the suit was a 4 way stretch "wet look" charcoal grey lycra from www.spandexworld.com. 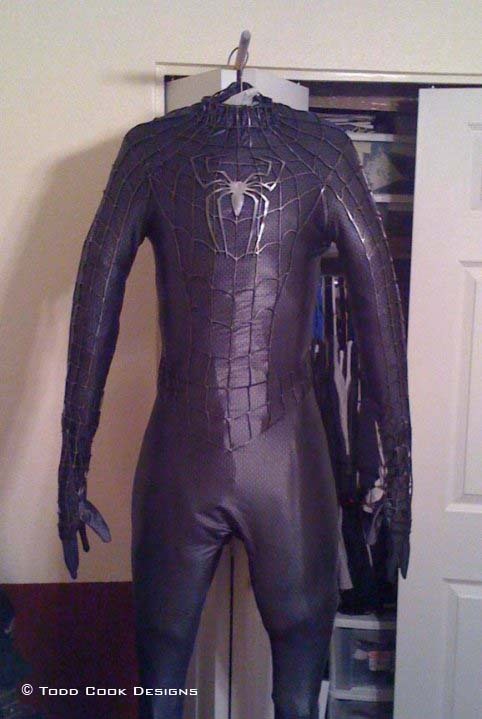 I needed up going with the charcoal grey even though the suit is black in the movie because I was going to add a black brick pattern over top of the grey lycra. 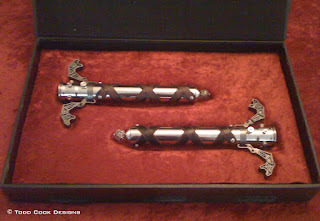 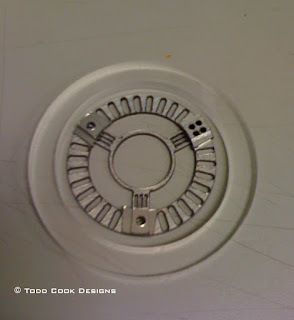 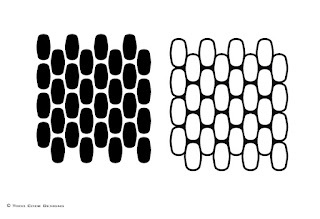 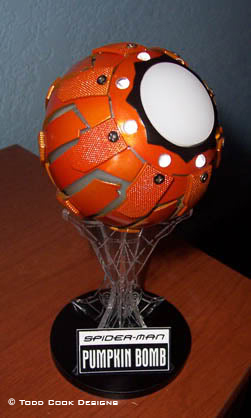 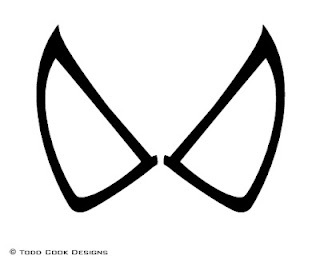 To achieve this I designed a pattern in Adobe Illustrator that was the same as the pattern used in the movie. 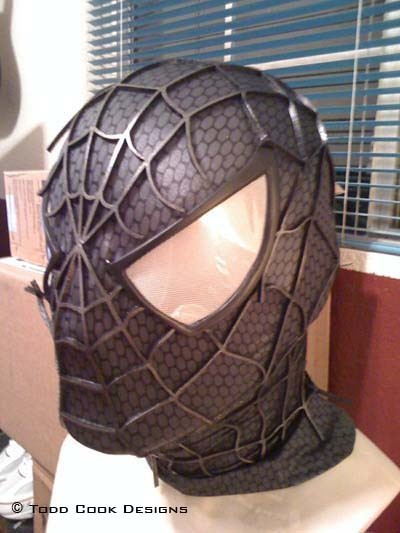 I then had this pattern cut in sheets of vinyl and applied it to the top of the grey lycra. 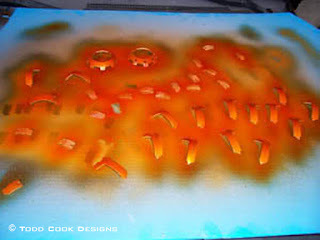 Once all the vinyl was applied I used a black fabric spray paint called Design Masters and sprayed over top of the entire fabric. 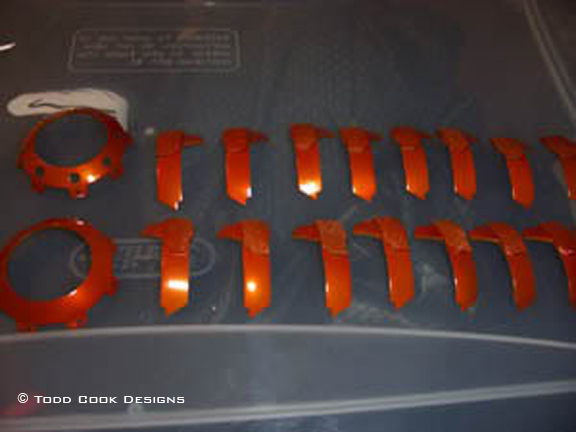 Once the paint was fully dried I pulled the thousands of little vinyl stickers off revealing the new patterned material. This is NOT how it was done in the movie, but it was what I had access to at the time. The next step was to have the material cut and sewn to the same pattern as they used in the movie. The reasoning for this is because the urethane webs are applied on top of the seems, making the suit look seem-less. I ended up buying a red/blue suit pattern off of eBay at the time that I used for the pattern. 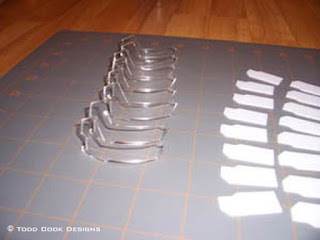 Unfortunately I dont have any pictures of the pieces laid out in pattern form. 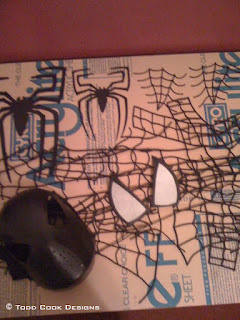 On to the urethane webs! Along with the original suit pattern I bought, it also had the web pattern on it as well. 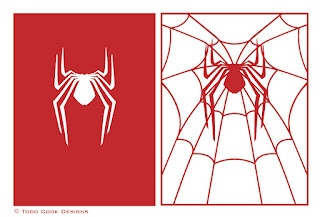 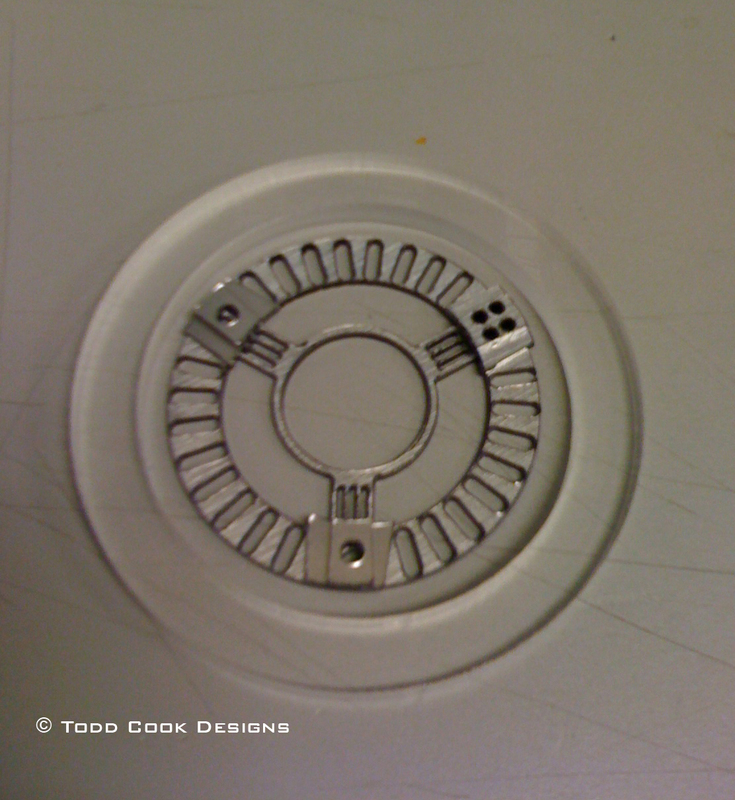 In Adobe Illustrator I removed the webs from the original file and made them their own file which I could use later to have web molds made. 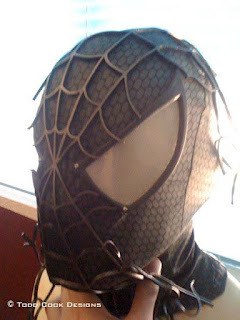 I decided to use Smooth-On's ReoFlex 30 urethane for the webs which would be strong enough and flexible enough to stretch with the suit once it was glued in place. Unfortunately the urethane is beige in color and I wanted them to be black. 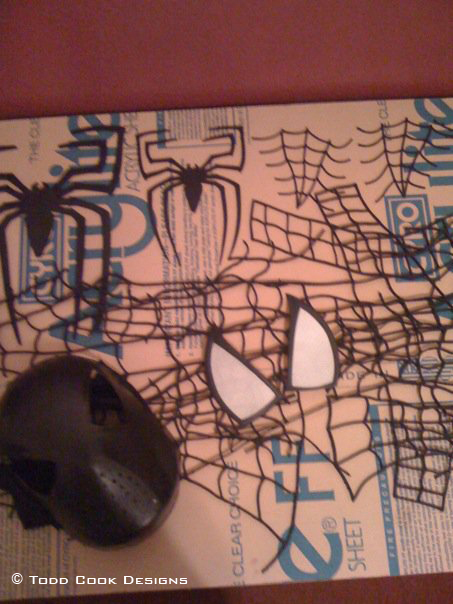 I tried adding color tint to the rubber, but it only weakened it because of how thin the webs are. 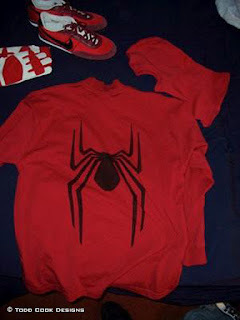 I finally settled on using fabric dye to dye the finished cast webs. 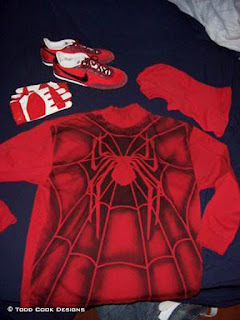 Once the webs were dyed and dried, they were coated with graphite to give then the shine like in the movie. Many test fits were done to ensure the webs would fit correctly on the suit before anything was glued down. In this picture you can see the brick pattern very clear on my hand and the shine of the webs from the graphite. 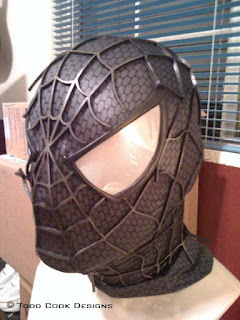 So once all the webs were cast and coated, I wanted to make the eye lenses before I started gluing everything down. 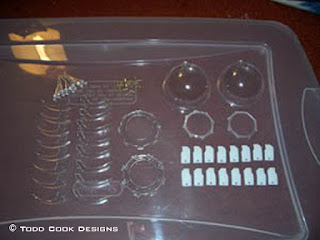 For this I also made an Adobe Illustrator template that I would used to later sculpt the lenses. 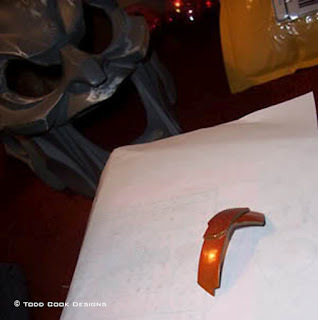 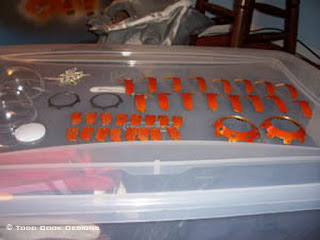 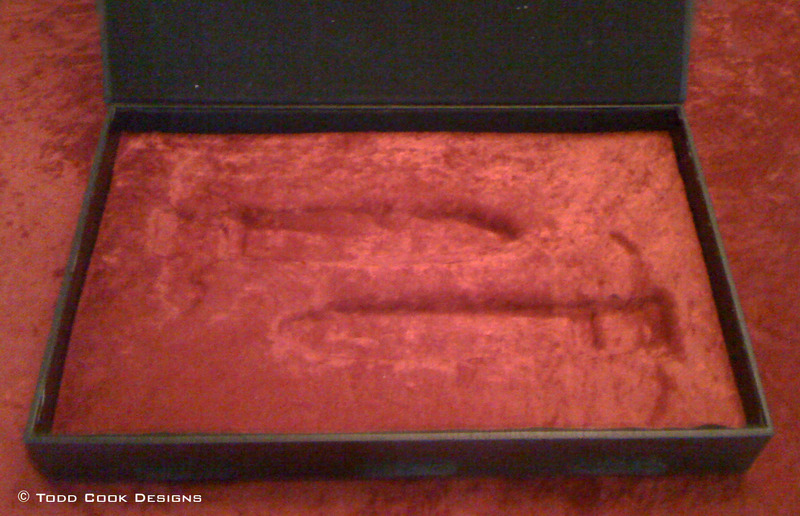 A mold was then made from the sculpted pieces and the final frames were cast in black urethane plastic. 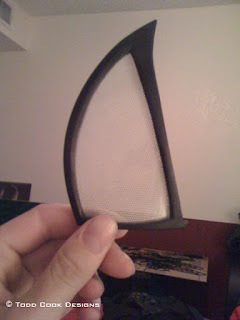 The inside lens was made from thin PETG plastic and painted screen mesh from a cooking splatter screen. On the movie suit the eyes were not permanently attached to the mask they clipped onto a face shell that was under the mask, so that is how I wanted my suit to be. I ended up making a fiberglass buck for a vacuum table and heated ABS plastic over top of it. 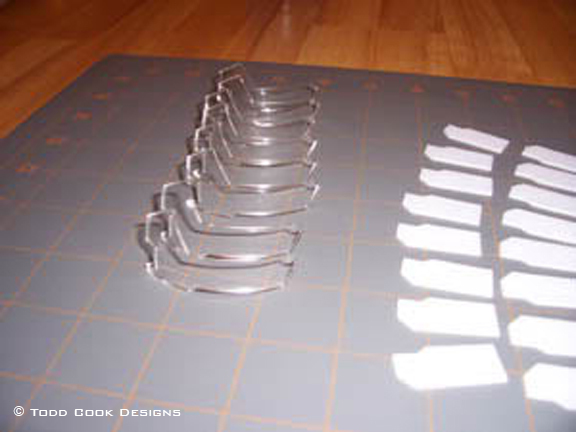 Now with all the parts manufactured I could start the final assembly. 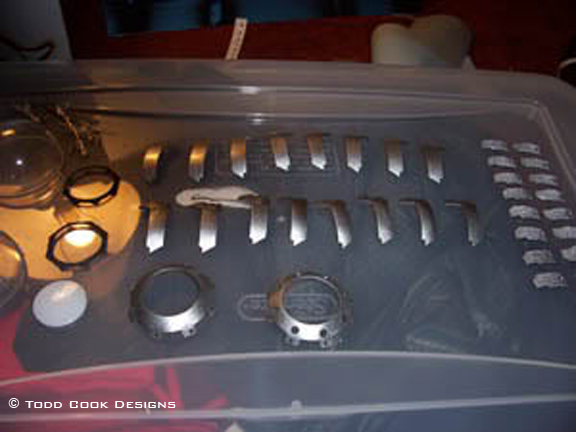 Many objects were used in the final assembly of the suit. 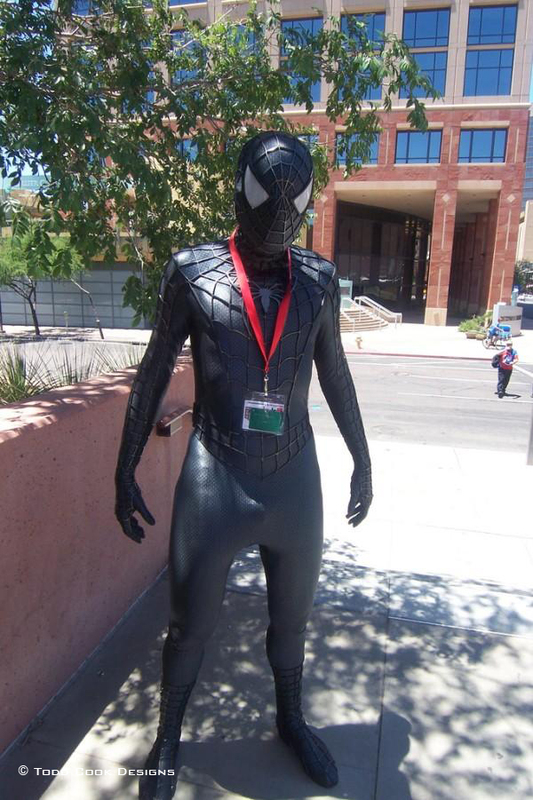 A duct tape dummy was made of myself to correctly fit the webs on the suit. 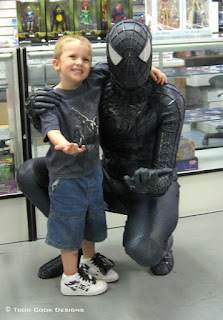 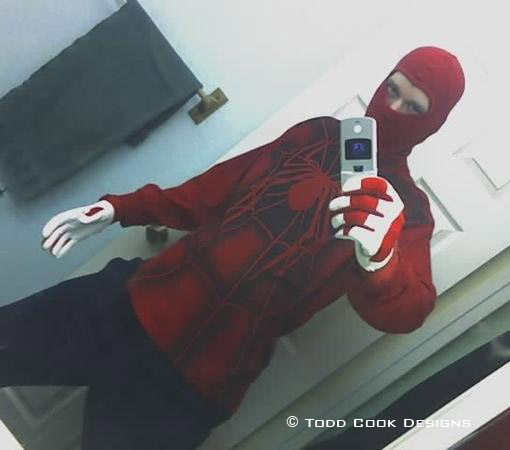 I also had a friend that was my same height and build wear the suit so I could position the webs correctly. A fiberglass mannequin and a life size human head bust were also used. 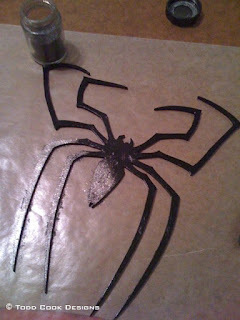 All the webs were glued down with Loctite Super Glue Gel. 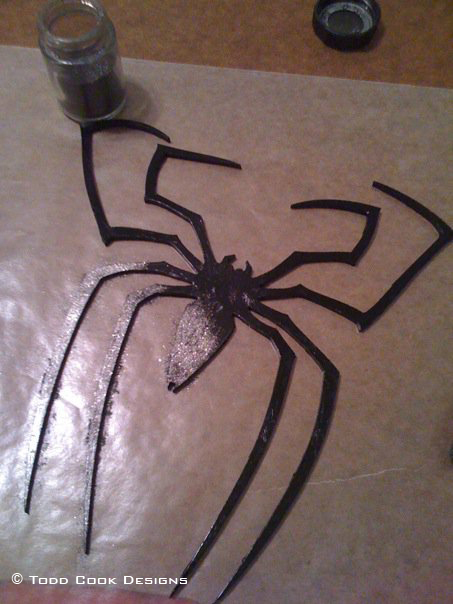 The great thing about super glue gel is that is sits on the fabric as opposed to seeping into the fabric. 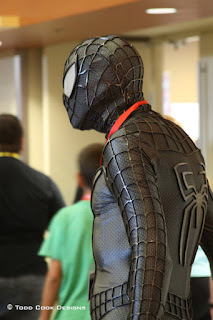 There was a lot to this suit and I just kind of gave you all a brief "how to" of how this suit was made. So if you have any questions feel free to ask as I will answer them the best I can.